Gene expression profiling has established that breast cancer comprises a group of biologically distinct diseases., According to St Gallen International Breast Cancer Conference (2011), breast cancer subtypes (BCS) are classified as luminal A; luminal B; luminal human epidermal growth factor receptor 2 (HER2); HER2; and triple negative (TN)., Significant differences have been observed in response to treatment and survival outcome among these BCS.,,, Therefore, accurate prognosis depends on multiple variables. The prognostic values of these variables are independent of other clinicopathological variables, such as patient age, lymph node status, histologic grade, tumor size, estrogen receptor (ER) status, and systemic therapy. The prognostic significance of lymphovascular invasion (LVI) in breast cancer was described more than four decades ago. Since then, several independent studies have investigated the prognostic significance of LVI in breast cancer. The 2007 St Gallen guidelines subsequently concluded that only extensive LVI should be used as an adverse prognostic factor. However, these guideline definitions are still relatively vague and require more evidence. Several authors have underscored a strong relation between LVI and lymph node status of patients with breast cancer ,,, and were also recently reported to be a strong predictor of breast cancer survival.,, LVI is a part of risk assessment and delivers significant prognostic information, although with limited predictive value.,, Although BCS and LVI have both been independently demonstrated as prognostic factors, there is a paucity of data describing the relationship between the two. Consequently, the primary objective of this investigation was to evaluate the prognostic power of LVI among BCS. The secondary objective was to investigate whether there is an association with LVI and lymph node status among BCS with regard to the overall survival (OS) and recurrence-free survival (RFS) rates. From an institutional database, 2017 women were consecutively selected from patients with confirmed histopathological diagnosis with breast cancer treated between January 2006 and December 2011. Information recorded for each patient included age at diagnosis, year of diagnosis, and date of death or last contact. Total incidences of recurrence or death from breast cancer were ascertained from follow-up lasting until 31 June 2013. Institutional review board approval was obtained through our institution's human investigations committee. Patients were treated with either mastectomy or breast-conserving surgery. After completion of surgery, endocrine therapy, and local radiotherapy or adjuvant systemic treatments were administered as indicated based on the international recommendations. Interrelationships between variables were assessed using contingency table analysis with the Chi-square test for trend as appropriate. Univariate and multivariate survival analyses were performed using the Kaplan–Meier analysis and Cox proportional hazards model with a stepwise backward elimination to derive a final model of variables with a significant independent relationship with OS and RFS. All statistical analyses were two-sided with significance defined as P < 0.05. All statistical analysis was performed using the SPSS Software version 18.0 (SPSS Inc., Chicago, IL, USA). The clinicopathological BCS characteristics among the 2017 patients included in this study are shown in [Table 1] (the total number of cases and controls do not correspond because of missing data). For the entire cohort, the median follow-up OS period was 42.7 months. The luminal A/B consisted of 1290 patients (64%), the luminal HER2 consisted of 499 patients (24.7%), the HER2 consisted of 119 patients (5.9%), and the TN consisted of 109 patients (5.4%). These features differed among subtypes with respect to tumor size, LVI, lymph node status, treatment factor (operation type, received chemotherapy, and hormone therapy), OS, and RFS. The luminal A had smaller tumor size (64.7%) more than other subtypes, less to presence of LVI, and lymph node involvement (10.6% vs. 23.0%, respectively). 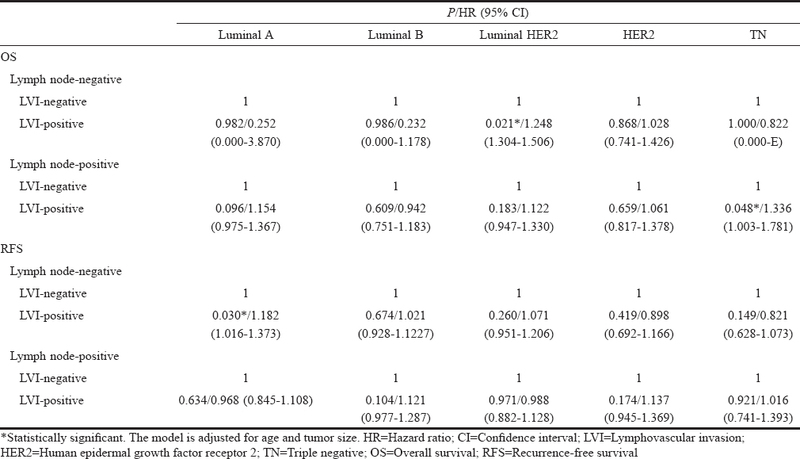 Highest incidence of LVI positivity (26.4% vs. 26.9%, respectively) and lymph node involvement (39.7% vs. 36.4%, respectively) occurred in the luminal B and luminal HER2 subtypes. The TN was more likely to have a larger tumor size (12.0%) more than other subtypes. With regard to treatment, most patients (90.1%) underwent surgery, of which 32.6% underwent surgery for breast conservation and 57.5% as modified radical mastectomy. In addition, 57.8% received radiotherapy, 74.1% received chemotherapy, and 68.4% received endocrine therapy. 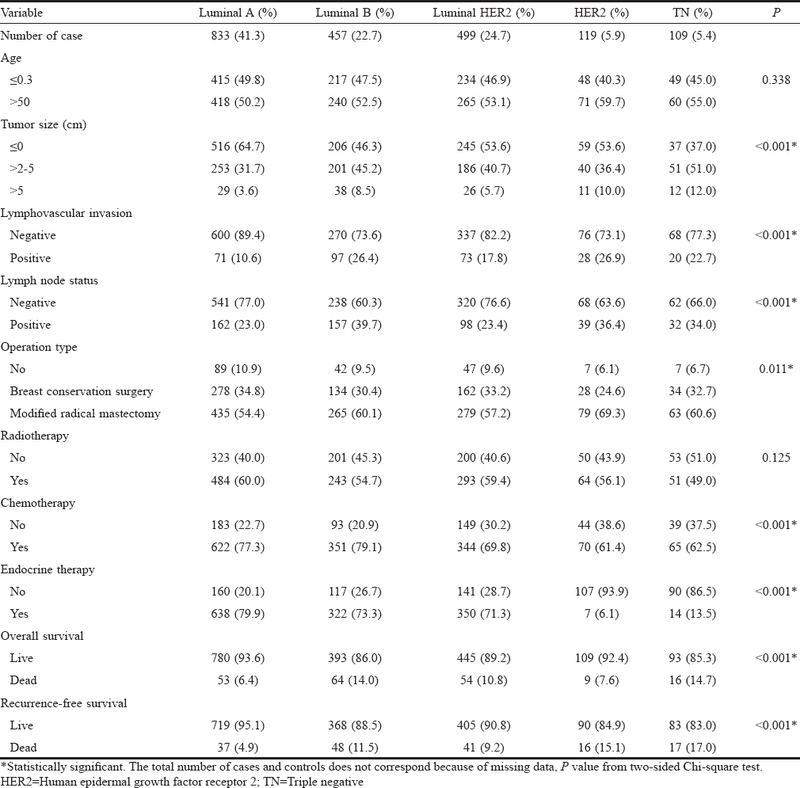 Of the 2,017 patients with breast cancer in the BCS group, highest OS, and RFS rate were observed in luminal A (93.6% vs. 95.1%, respectively) and lowest OS and RFS rate were observed in TN (85.3% vs. 83.0%, respectively) [Table 1]. There were significant differences in the OS and RFS rates according the LVI among the BCS [Figure 1] and [Figure 2]. There were significant differences in OS according to the LVI in the distribution of luminal A (P = 0.002), luminal B (P = 0.024), luminal HER2 (P < 0.001), and TN (P = 0.033) subtypes. There were also significant differences in the RFS in the luminal B, luminal HER2, and HER2 subtypes (P = 0.004, <0.001, and 0.024, respectively). On cox proportional hazards model, after controlling for age and tumor sizes was independently associated with LVI among BCS [Table 2]. There were significant differences in OS according to the LVI in the distribution of luminal A (P = 0.021), and luminal HER2 (P < 0.001). There were also significant differences in the RFS in the luminal HER2 (P = 0.002). The luminal B and TN subtype, however, did not reach statistical significance in OS. The luminal B and HER2 subtype, however, did not reach statistical significance in RFS. Therefore, we inferred that there were stronger links among age and tumor size than LVI in the luminal B, HER2, and TN subtypes according the OS and RFS. On multivariate analysis, after controlling for age and tumor sizes was independently associated with LVI and lymph node status among BCS [Table 3]. There were significant differences in OS according to the lymph node-negative and LVI-positive in the distribution of luminal HER2 (P = 0.021/[odds ratio [OR], 1.248; 95% confidence interval [CI], 1.304–1.506]), the lymph node-positive and LVI-positive in the distribution of TN (P = 0.048/[OR, 1.336; 95% [CI], 1.003–1.781]). There were also significant differences in the RFS according to the lymph node-negative and LVI-positive in the luminal A (P = 0.030/[OR, 1.182; 95% [CI], 1.016–1.373]). Previous well-designed studies have analyzed the prognostic factors in patients with invasive breast cancer. Lymph node involvement, age, high histological grade, and large tumor size were significantly associated with a poor survival outcome among BCS., In our series, a significant association with tumor size (P < 0.001), OS (P < 0.001), and RFS (P < 0.001) among BCS, in which TN subtype were associated with a larger tumor size, poor OS, and RFS survival outcome which is in accordance with previous studies.,, Previous studies have also shown that LVI is an independent poor prognostic factor in patients with breast cancer. LVI, means cancer cells within lymphovascular channels, is a crucial step in the invasion-metastasis cascade. LVI, when identified morphologically in the peritumoural area, is an indicator of metastatic potential and is strongly associated with poor prognosis in many solid tumors, including breast cancer.,,, In the present study, we also found a significant association between LVI and BCS (P < 0.001) [Table 1]. Highest incidence of LVI positivity occurred in the luminal B and HER2 subtypes. In survival outcome, there were significant differences in luminal A, luminal B, luminal HER2 and TN subtype between LVI with OS. Regarding RFS, there were significant differences in luminal B, luminal HER2, and HER2 subtype with LVI. Even adjusting the age and tumor size for OS and RFS by multivariate Cox proportional hazard analysis, a statistically significant difference remained among the luminal A and luminal HER2 subtypes. Based on our data, we observed a higher relationship with age and tumor size for luminal B, HER2, and TN. According to our research data, even adjusting the age and tumor size for OS and RFS in lymph node-negative breast cancer patients by multivariate Cox proportional hazard analysis, a statistically significant difference remained among the luminal HER2 with OS (P = 0.034; hazard ratio [HR]: 5.948; 95% CI, 1.148–30.809) and TN subtypes with RFS (P = 0.034; HR: 13.495; 95% CI, 1.215–149.886). Rakha et al. reported that LVI provides independent prognostic information for ER-negative and TN subtype in lymph node-negative breast cancer patients was similar our finding. Ragage et al. reported that LVI is an independent prognostic factor in lymph node-positive breast cancer. According to our research data, even adjusting the age and tumor size for OS and RFS in lymph node-positive breast cancer patients by multivariate Cox proportional hazard analysis, a statistically significant difference remained among the luminal A with OS (P = 0.029; HR: 4.505; 95% CI, 1.163–17.454) Song et al. reported that LVI provides independent prognostic information for hormone receptor in lymph node-positive breast cancer patients was similar to our finding. This is an important finding, as OS and RFS rates can be accurately measured among BCS groups according to lymph node status and LVI. Strengths of our study are the performance of ER, PR, HER2 and LVI testing in a single pathology laboratory. However, there are several potential limitations to this study. First, the data used in this study are retrospective. Second, the small sample sizes may have influenced the statistical calculations. However, despite the small numbers, to the best of our knowledge, the current study represents one of the largest series in the literature to date. There were studies discussed about the relationship between LVI and individually BCS, but no literature talked about the prognostic value of LVI and all BCSs. Nonetheless, a number of other studies on the prognostic value of LVI between BCS in more contemporary cohorts have similarly reported that LVI is adequate to predict treatment outcomes in patients with various BCS. We found that the LVI and lymph node status were an important prognostic factor for OS and RFS among BCSs. There were significant differences in OS according to the lymph node-negative and LVI-positive in the distribution of luminal HER2, the lymph node-positive, and LVI-positive in the distribution of TN. There were also significant differences in the RFS according to the Lymph node-negative and LVI-positive in the luminal A. The authors would like to thank Enago (www.enago.tw) for the English language review. Perou CM, Sørlie T, Eisen MB, van de Rijn M, Jeffrey SS, Rees CA, et al. Molecular portraits of human breast tumours. Nature 2000;406:747-52. Sørlie T, Perou CM, Tibshirani R, Aas T, Geisler S, Johnsen H, et al. Gene expression patterns of breast carcinomas distinguish tumor subclasses with clinical implications. Proc Natl Acad Sci U S A 2001;98:10869-74. Kast K, Link T, Friedrich K, Petzold A, Niedostatek A, Schoffer O, et al. Impact of breast cancer subtypes and patterns of metastasis on outcome. Breast Cancer Res Treat 2015;150:621-9. García Fernández A, Giménez N, Fraile M, González S, Chabrera C, Torras M, et al. Survival and clinicopathological characteristics of breast cancer patient according to different tumour subtypes as determined by hormone receptor and Her2 immunohistochemistry. A single institution survey spanning 1998 to 2010. Breast 2012;21:366-73. Haque R, Ahmed SA, Inzhakova G, Shi J, Avila C, Polikoff J, et al. Impact of breast cancer subtypes and treatment on survival: An analysis spanning two decades. Cancer Epidemiol Biomarkers Prev 2012;21:1848-55. Engstrøm MJ, Opdahl S, Hagen AI, Romundstad PR, Akslen LA, Haugen OA, et al. Molecular subtypes, histopathological grade and survival in a historic cohort of breast cancer patients. Breast Cancer Res Treat 2013;140:463-73. Ortiz AP, Frías O, Pérez J, Cabanillas F, Martínez L, Sánchez C, et al. Breast cancer molecular subtypes and survival in a hospital-based sample in Puerto Rico. Cancer Med 2013;2:343-50. Teel P. Vascular invasion as a prognostic factor in breast carcinoma. Surg Gynecol Obstet 1964;118:1006-8. Goldhirsch A, Wood WC, Gelber RD, Coates AS, Thürlimann B, Senn HJ, et al. Progress and promise: Highlights of the international expert consensus on the primary therapy of early breast cancer 2007. Ann Oncol 2007;18:1133-44. Dekker TJ, van de Velde CJ, van Bruggen D, Mesker WE, van der Hoeven JJ, Kroep JR, et al. Quantitative assessment of lymph vascular space invasion (LVSI) provides important prognostic information in node-negative breast cancer. Ann Oncol 2013;24:2994-8. 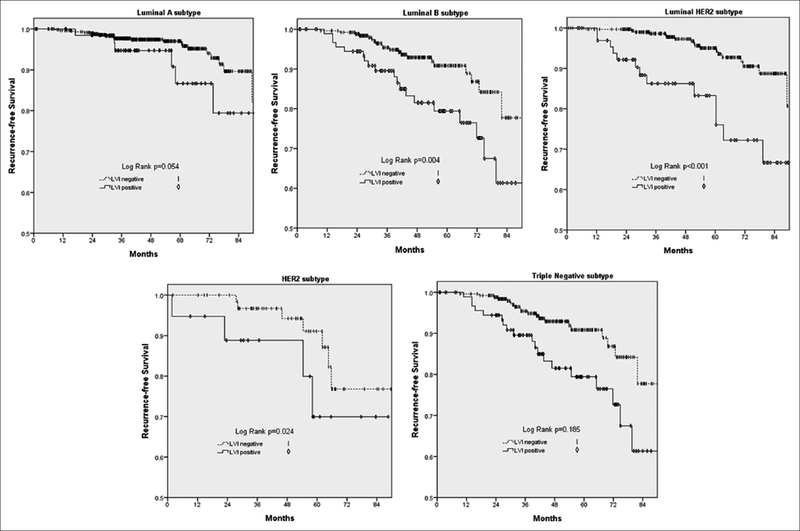 Ugras S, Stempel M, Patil S, Morrow M. Estrogen receptor, progesterone receptor, and HER2 status predict lymphovascular invasion and lymph node involvement. Ann Surg Oncol 2014;21:3780-6. Ragage F, Debled M, MacGrogan G, Brouste V, Desrousseaux M, Soubeyran I, et al. Is it useful to detect lymphovascular invasion in lymph node-positive patients with primary operable breast cancer? Cancer 2010;116:3093-101. Gurleyik G, Gurleyik E, Aker F, Aktekin A, Emir S, Gungor O, et al. Lymphovascular invasion, as a prognostic marker in patients with invasive breast cancer. Acta Chir Belg 2007;107:284-7. Gujam FJ, Going JJ, Edwards J, Mohammed ZM, McMillan DC. The role of lymphatic and blood vessel invasion in predicting survival and methods of detection in patients with primary operable breast cancer. Crit Rev Oncol Hematol 2014;89:231-41. Gujam FJ, Going JJ, Mohammed ZM, Orange C, Edwards J, McMillan DC, et al. Immunohistochemical detection improves the prognostic value of lymphatic and blood vessel invasion in primary ductal breast cancer. BMC Cancer 2014;14:676. Fidalgo F, Rodrigues TC, Pinilla M, Silva AG, Maciel Mdo S, Rosenberg C, et al. Lymphovascular invasion and histologic grade are associated with specific genomic profiles in invasive carcinomas of the breast. Tumour Biol 2015;36:1835-48. Ejlertsen B, Jensen MB, Rank F, Rasmussen BB, Christiansen P, Kroman N, et al. Population-based study of peritumoral lymphovascular invasion and outcome among patients with operable breast cancer. J Natl Cancer Inst 2009;101:729-35. Colleoni M, Rotmensz N, Maisonneuve P, Sonzogni A, Pruneri G, Casadio C, et al. Prognostic role of the extent of peritumoral vascular invasion in operable breast cancer. Ann Oncol 2007;18:1632-40. Carlson RW, Edge SB. Update: NCCN breast cancer clinical practice guidelines. J Natl Compr Canc Netw 2004;2 Suppl 3:S-1-4. Mazouni C, Rimareix F, Mathieu MC, Uzan C, Bourgier C, André F, et al. Outcome in breast molecular subtypes according to nodal status and surgical procedures. Am J Surg 2013;205:662-7. Xue C, Wang X, Peng R, Shi Y, Qin T, Liu D, et al. Distribution, clinicopathologic features and survival of breast cancer subtypes in Southern China. Cancer Sci 2012;103:1679-87. Chen ST, Lai HW, Tseng HS, Chen LS, Kuo SJ, Chen DR, et al. 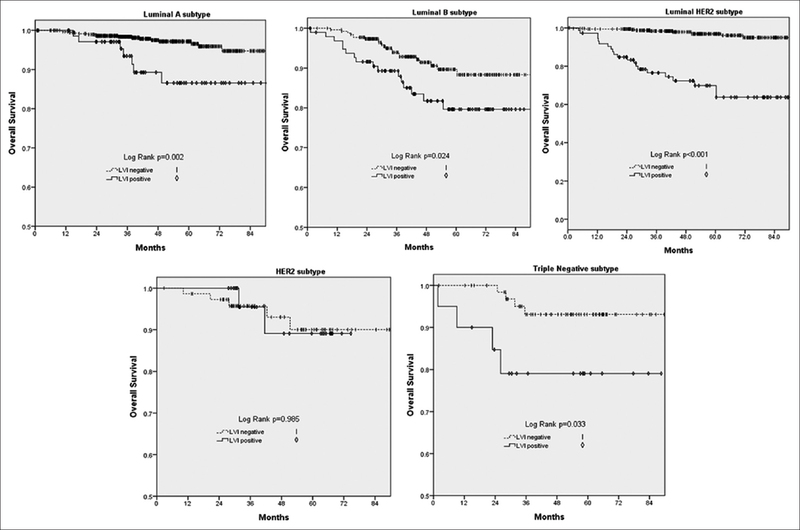 Correlation of histologic grade with other clinicopathological parameters, intrinsic subtype, and patients' clinical outcome in Taiwanese women. Jpn J Clin Oncol 2011;41:1327-35. Liao GS, Chou YC, Hsu HM, Dai MS, Yu JC. The prognostic value of lymph node status among breast cancer subtypes. Am J Surg 2015;209:717-24.
von Minckwitz G, Untch M, Blohmer JU, Costa SD, Eidtmann H, Fasching PA, et al. Definition and impact of pathologic complete response on prognosis after neoadjuvant chemotherapy in various intrinsic breast cancer subtypes. J Clin Oncol 2012;30:1796-804. Salhia B, Tapia C, Ishak EA, Gaber S, Berghuis B, Hussain KH, et al. Molecular subtype analysis determines the association of advanced breast cancer in Egypt with favorable biology. BMC Womens Health 2011;11:44. Puig-Vives M, Sánchez MJ, Sánchez-Cantalejo J, Torrella-Ramos A, Martos C, Ardanaz E, et al. Distribution and prognosis of molecular breast cancer subtypes defined by immunohistochemical biomarkers in a Spanish population-based study. Gynecol Oncol 2013;130:609-14. Jones T, Neboori H, Wu H, Yang Q, Haffty BG, Evans S, et al. Are breast cancer subtypes prognostic for nodal involvement and associated with clinicopathologic features at presentation in early-stage breast cancer? Ann Surg Oncol 2013;20:2866-72. Gangi A, Mirocha J, Leong T, Giuliano AE. Triple-negative breast cancer is not associated with increased likelihood of nodal metastases. Ann Surg Oncol 2014;21:4098-103.